When designing and building a new home, sometimes the exterior of the property can become an afterthought. But, when you consider that it’s the first bit that friends and family will see when coming to visit, it becomes more apparent how much your front garden and driveway can contribute to the overall look and feel. A driveway is so much more than just a convenient area for off street parking – it’s first impressions that count, so if you’re putting a lot of time, money and effort into building your dream home, then why cut corners when it comes to the outside? Designing the perfect driveway is all in the planning, so, make sure you leave room for it in your budget and to help you get started, here are our top ten tips to consider when you’re thinking about ways to do it. Size – how big will your drive be? Will it look appropriate to the size of your home? How many cars are there in your family – will they all fit on your new driveway? Do you have friends over regularly – will they need places to park? Driveway to front garden ratio – what do you need more of? Which is more important to you? Shape – the design is all important when it comes to the kerb appeal of your home. If you’re looking for elegance, for example, you may choose a broad, sweeping driveway and floral island in the centre. Is it in keeping with the rest of the property? How will it look in front of your home? Will it match the style and design of the house you are building? What will you use it for? Just parking, or a place to store pot plants etc? How easy does it need to be to maintain with regard to weeding, washing and upkeep? The sides – what kind of borders will you have? For example, brick paving is popular to enclose a gravel driveway, or perhaps you like decorative floral borders to give added overall appeal. Consider what your perfect driveway is made of. You can choose from a variety of materials, including gravel, loose slate, paving slabs, brick paved, tarmac and concrete. Space – give yourself plenty of it on either side of your vehicle, to avoid bashing wing mirrors or scraped paintwork when parking your car. Have room to manoeuvre if needed. The future – will there need to be space for more cars in the future perhaps? Do you have teenage children who could soon be learning to drive? All the above are questions you should be asking yourself when designing the ideal driveway. 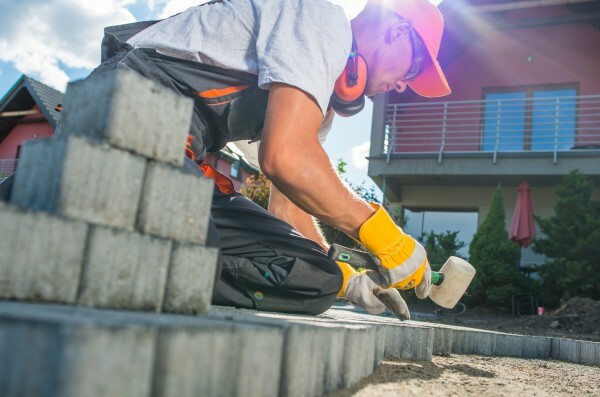 If you are in the process of designing and building a new home, or even if you’re making renovations to an existing property, then contact us today about your new driveway and how we can make it perfect for your needs. With many years’ experience of house building and landscaping for homes across Leicestershire, our design team can help – from the initial concept, right through to the grand, appealing, or just plain practical, finished result at the end.